The Mobile App Market is one of the leading industries nowadays. Since their very first appearance, mobile apps and smartphones have evolved a lot during the last few years, attracting more and more users day by day. Despite the success of the mobile app market, there is one common issue that mobile publishers face nowadays: app discovery. In this ASO Guide, we will see how to address the visibility challenges, how to improve discoverability and conversion rate of apps to increase downloads. 3 Bonus: implement these PRO ASO Tricks! 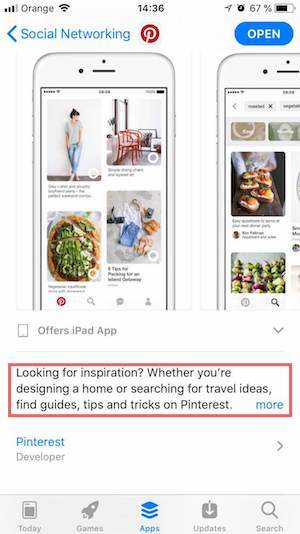 Improved app discoverability: an optimized product page will rank higher in search results and potential users will find your app more easily. 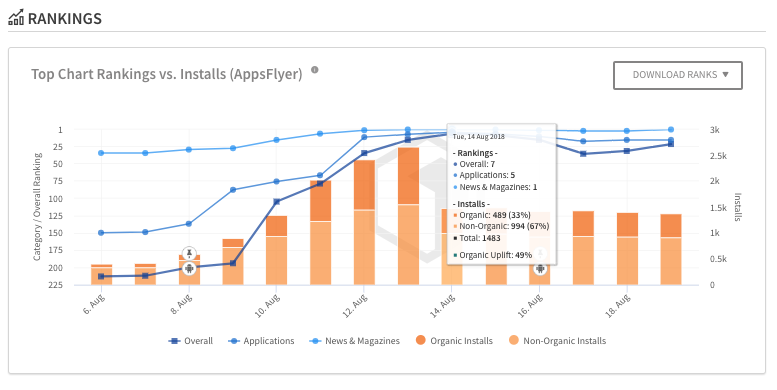 Increase in organic installs: more users will discover and download your app organically (so, completely FREE for you). Improved Conversion Rate to Install: you get more users who are visiting your listing to download an app, and thus, taking more advantage of the traffic you get. Lower acquisition costs: more organic installs would derive in lower eCPI (Effective Cost Per Install) in case you run paid marketing campaigns. 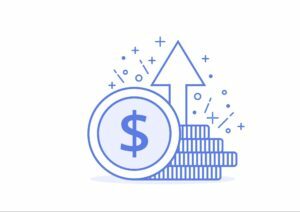 Stable app monetization: the more users you have the more likely they are to spend money on your app (app purchases, subscriptions or ads). On-metadata factors -the ones that fall under the direct control of a developer and can be easily modified form Google Play Console or App Store Connect. On-metadata factors include: App Name / Title, Subtitle, Keywords Field & Promotional Text (App Store only), Short & Long Description, URL / Package (Google Play only), Icon, Screenshots, Feature Graphic (Google Play only), Video and App Size. Off-metadata factors – the ones that cannot be controlled, but can be influenced by developers in order to improve them. Off-metadata factors include: volume & velocity of installs, volume of ratings and reviews and the average rating. To learn more about the App Store Optimization factors and the effect they have on Search Rankings and Conversion Rate, take a look at the ASO Factors Expert Survey, based on the expertise and experience of 60+ mobile app marketing professionals. As we just mentioned, App Store Optimization is an ongoing process that consists of three different steps. Let’s dive right in and see how to start out with your ASO strategy and rock it! Keyword Research is the first essential step in ASO – in order to get visibility, you need to target the right keywords for your project. Start by brainstorming the initial list of keywords – think about the value that your app brings and its main functionalities. What problem does it solve for your target audience? As the next step, carry out a market research. Who are your main competitors? What category do they belong to? What keywords are they ranking for? At this point you will need the help of an ASO tool like TheTool. Brainstorm to describe your product and the tasks it performs. Do you have an app with a social value? Is it a business app? Is it a shopping one? Do you have a mobile game? What is the gameplay, levels, main characters? Try to answer these questions and you will already have a good set of keywords to work with. Think about your audience. Think of your target users and the language they might be speaking – this will give you an idea of the keywords they would use to find your app. Check out your competitors. It is always recommendable to identify the terms they are targeting in order to copy their strategy or to choose a completely different path. Look for keyword suggestions. Expand your list of keywords by looking at keyword suggestions – you can do that with the autocomplete feature on the app stores or using an ASO tool. It’s really important that you include mid- and long-tail keywords in your set, ranking for generic terms is not always easy, especially if the app is new on the market. Traffic and Difficulty Estimations. Pick the keywords that will help you get high visibility in Search – choose keywords with a good balance between high traffic and medium difficulty (not too competitive). Trying to target only high-volume generic keywords can be very challenging for new apps – instead, you can get more visibility on long-term keyword combinations. It is always better to rank high for lower-volume keywords, than rank low on high-volume ones. Visibility is key! Competitors Rankings. Keeping an eye on your competitors is always wise – monitor their keyword rankings to identify possible niches and opportunities to stand out from them. Apple Search Ads. If you are running Apple Search Ads for your iOS app or game, you can use the ASA metrics as performance indicators to evaluate your keywords. Apple Search Ads allows you to compare Conversion Rate and Search Volume on different keywords – and decide which ones are the most relevant for your app. Remember, Apple Search Ads is available in more countries now! It is important to work with an extensive list of keywords: at least 60-120 per country. Many times the users would rather carry out specific search than broad one. Working with relevant keyword suggestions is key: when there are suggestions, there is traffic, so select all the relevant combinations that can help you drive the users with download intent to your app. Now that you have built your set of keywords, it’s time to include them to your listing (in the right places!) and see the effect. This field is one of the strongest rankings factors in both app stores – App Name / Title is responsible for search rankings and also plays a role in the conversion rate to download. On Google Play Store, you can use up to 50 characters in the Title to add some of your most powerful keywords alongside your brand name. Keep your brand name short and catchy – and include the keywords that identify your app’s main purpose or value. On the App Store, however, space is quite limited – only 30 characters – so keep it short and concise. It’s a real challenge! Come up with a memorable brand name and include some of your core keywords here. The subtitle has been introduced with the iOS 11 and is a short (30 characters) field that has an effect not only on search rankings, but as well on the click-through rate (CTR) and conversion rate (CR) of your app. CTR measures the rate of users who found your app in search results, to those visiting your product page, and CR measures the rate of page visitors to app downloads. The main goal of the Subtitle is to add additional information about the product. Use this field to highlight your app’s best features or functionalities and add important keywords. Don’t include those you already added to your App Name – use the space wisely. Short Description is an 80-character field, used to emphasize the value of your app and deliver a clear & catchy message – and you should definitely include your main keywords here! On Google Play Store, the short description has an effect on both search rankings and conversion rate to download, so it is important to keep the balance between your search optimization and CR optimization efforts. On the App Store you can find a 100-character field dedicated to introducing your target keywords. The keyword field affects your search rankings, but is not visible to the end users. Introduce your keyword set here without spaces and separating the words with commas. Apple will mix and match these keywords and create all possible combinations for you. In addition, remember to not add the same keywords that you have already added in the App Name or Subtitle. The long description plays a completely different role in each one of the main app stores. For Android apps on Google Play, the long description is a really important field – you have to introduce your keyword combinations here and use the most important ones a few times – to keep a sufficient density of keywords (2-3%). You have 4,000 characters which you can use to come up with a neat and well-structured description that would ideally include all valuable information (and a catchy call-to-action) that would help you encourage your users to install your app. In the case of the App Store though, the description does not affect keyword rankings (but, it does affect the visibility in mobile web search). Read about SEO for mobile apps to learn more. Bear in mind that the first sentences (first 3 lines) of your app description should be the most catchy ones to encourage the users to tap and see more – be creative here! After optimizing the textual elements of your product page, it’s time to learn how to improve Conversion Rate to download. There are many app developers or app marketer that really struggle at this point because they receive a lot of visits but the percentage of visitors that ends up download the app or game is rather low. Visual assets and user ratings are the main elements responsible for Conversion Rate on both app stores. In addition, you should alsopay special attention to app size – it could be a turndown, as the apps over 100MB can not be downloaded using cellular service. Your app icon should be really catchy – all eyes will be on it when the users find your app while searching or navigating the stores – so you need to be creative and unique. Don’t overload it with different colours and many details, it’s better to keep it simple. Don’t forget to make it scalable – allow users to see the best version of your icon in different devices. Source: Football Strike – Multiplayer Soccer,ROBLOX, Shazam and LOVOO on Google Play Store. App screenshots help you put a spotlight on your app’s features and give the users more reasons to download your app. Use the screenshots to create an interesting story line – strike attention! On Google Play Store, you can add up to 8 different screenshots per device, on the App Store – 10 per device. Use text and call-to-action to draw attention to your best features. The first 2-3 screenshots are the most important ones – make them count! 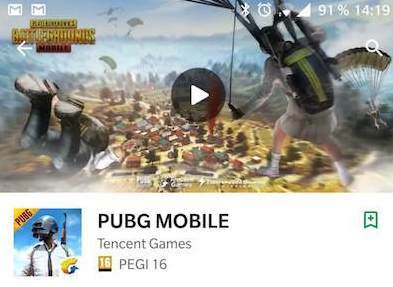 In addition to the screenshots, the apps and games on Google Play Store can have a feature graphic (image or video) – and this element plays an important role in Conversion Rate to install. If you are using a video, the thumbnail will act as your feature graphic. Don’t overwhelm your viewers with too many features, choose 3-5 best features and show them in the video. Keep it short, the first seconds are crucial in convincing users of your value and creating interest towards your product. In the case of the App Store, your videos can only be 30 seconds long. Check the format requirements of each store and create your video accordingly: App Store and Google Play Store. Now that you know how to optimize your visual assets it’s time to carry out A/B tests and find out what version of each visual elements performs better in terms of Conversion Rate. Make changes in one element at a time – otherwise you won’t be able to learn which element has caused the effect. Focus on A/B testing different creatives rather than on small changes. Test for around 5-7 days with a consistent traffic in order to see which option has the best conversion rate. Start testing with your icon, as this element affects both CTR on lists and conversion rate to install. Then test different screenshot combinations (try portrait and landscape) and other elements. If you are following our tips and detailed explanation so far, you are ready to go to the next step and start tracking the main ASO KPIs! Keyword rankings: keep track of your app position in Search results. Top Charts rankings: positions in Top Charts (Free, Paid and Grossing). 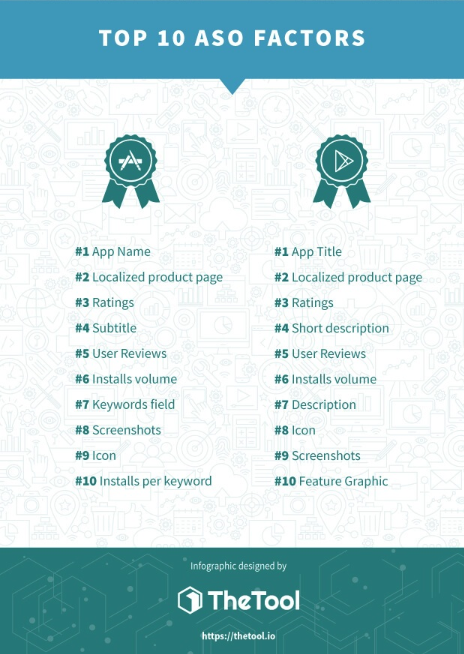 Category rankings: the position of your app or game in its main category. Featured: check if your app gets featured on the stores. Click-through Rate (CTR) or Tap-through Rate (TTR). This metric refers to the number of users that see your app in Search, Top Charts and Featured and tap to view its product page. Conversion Rate to Download (CR). Relates to the number of people that visit your product page and end up downloading your app / game. Without any doubt, one of the main goals of promoting our app in the stores is growth – that results in a high volume and velocity of installs. You should not only look at the number of installs, but at their type as well (organic and non-organic). Attribution trackers like AppsFlyer or Adjust can help you track your organic and non-organic installs separately. Anyway, you can always check this data on App Store Connect and Google Play Console. User feedback is an extremely important ASO factor. On one hand, ratings and reviews impact conversion rate, and on other other hand, the app stores algorithms take them into account for search rankings. First of all, create a flawless app. Make sure your app works properly before you launch it to the stores, in this case it’s better to launch it later than sooner (the app stores and the users love bug-free apps). Create an original and encouraging in-app feedback system. Make it easy for users to rate and review your app in the stores. The timing is really important – decide what’s the best time to ask users for feedback, for example, after completing a level or a purchase. Always answer to feedback, especially if it’s negative. Answering to feedback takes less than a minute and can help you turn a negative feedback into positive one! Average Revenue per User (ARPU). This metric is obtained by dividing the total revenue by the number of users. Lifetime Value (LTV) – a prediction of the amount of revenue that a particular user will generate. Revenue – total income generated by an app or game. When it comes to monetization, the quality of users is more important than the quantity. Users that spend more money and for a longer period of time are more valuable than the ones that just try your app and then leave. User feedback is crucial for a stable monetization – listen to your users and meet their needs – satisfied users will keep using your app for longer. Bonus: implement these PRO ASO Tricks! 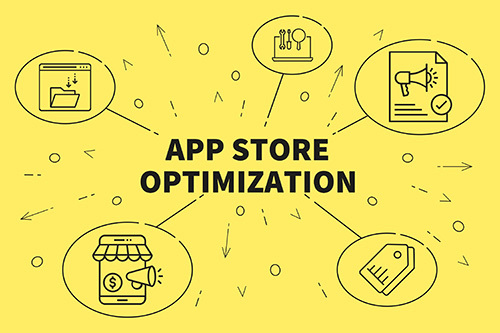 We didn’t want to finish this article without sharing with you some PRO tricks that will totally take your App Store Optimization strategy to the next level – take notes! Localizing your app is essential for its growth. There are nearly 5 billion unique mobile users – why not use the opportunity to turn them into customers? Check user reviews to find interesting keyword ideas. On Google Play, keywords in reviews are also taken into account for the ranking algorithm. Introduce keywords in the URL / Package and in the Developer Name. Read this article to find out why you should do it! Your video on Google Play Store can help you gain high positions in Google web search results – the views from Google Play Store count as YouTube views. Change your app listing seasonally and improve Conversion Rate. Update your app / game regularly – it will help you keep the users engaged and waiting for more. Build backlinks. The effect of backlinks anchor text on ASO can surprise you! Choose the right category for your app. Maybe you can rank higher in one category than in another. If your app has several functionalities you could fit in different categories – for example, Twitter is Social Media but it is listed under the “News” category. We hope that after reading this Ultimate ASO Guide, you feel ready to face your ASO goals and rock your Mobile Marketing strategy! 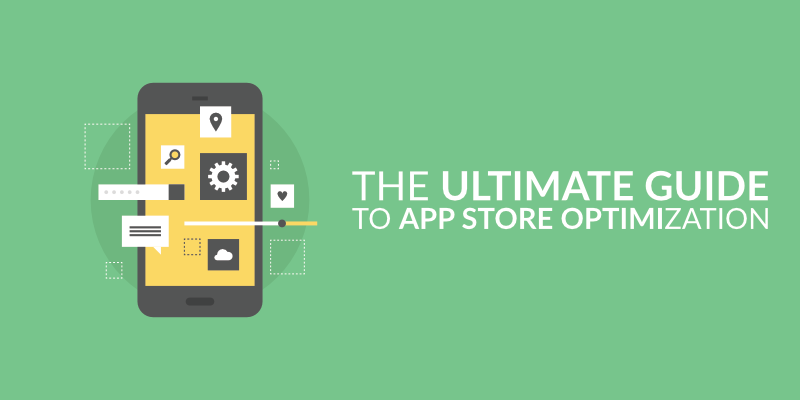 Remember that App Store Optimization is a continuous process – ASO is never a single-shot, but rather a marathon. Constantly track, test and tweak your strategy to ensure the best results and consistent growth. If you want to stand out from the crowd, your first goal is designing an unique product that has a clear value. Spend some time conceptualizing and developing your app and don’t rush it – do not upload your app or game to the stores if you are not 100% sure that your product is flawless. Start your ASO strategy as soon as possible and let us know if this guide helped you! Author Bio: Cristina Stefanova is a Content & SMM Strategist at TheTool, a powerful self-service platform for App Store Optimization, helping developers with the ASO of mobile apps and games in over 90 countries. Cristina writes about mobile app marketing strategies and she is interested in languages & technology!